Posted on Sunday, March 20th, 2011 at 9:13 pm. In the theatre as in any business, your website is more than the place where people come to see what you’re offering this season or check a show’s start time. It’s the content hub for your online presence. Every aspect of your content should be constructed to capitalize on your audience’s initial interest, convert them into paying customers (whether they buy tickets through your site or by some other means) and transform them into advocates who will help you grow your audience. Your company’s social media presence(s). Other theatre websites with whom you have connections. Personal web and social media sites belonging to individual company members. Anywhere else it makes sense for your content to appear. The more seamlessly your website performs this function, the more integrated and professional your content will appear (with the added benefit of minimizing the manual workload for your promotion team). Victoria-based Urban Arts Productions had a great product in their adaptation of Marie Antoinette: The Colour of Flesh, but weren’t able to translate that creative success into large audiences or a key critical review. This is my third post in a six-part case study on what they and other independent theatre companies might do to better-promote their creative work, capture larger audiences, and engage key critics. If you’re playing catch-up, read my overview post on their general publicity challenges and Part I for my suggestions on how video could enhance their theatre marketing efforts. Marie Antoinette: The Color of Flesh has ended its run since I saw the show in early March 2011. Urban Arts Productions has scaled back the related show content available on their site, which will make it a little harder to discuss from a visual standpoint. Nevertheless, when I was debating whether or not to buy tickets, the content was still relatively thin and the site’s Flash interface made the site slow, hard to read and cumbersome to navigate. Here are three content tactics that would have improved my browsing experience. Whether you have an army of communications professionals to build and support your website or you’re running it solo, your focus should be on creating and delivering the best content possible. No design decision should interfere with that goal. 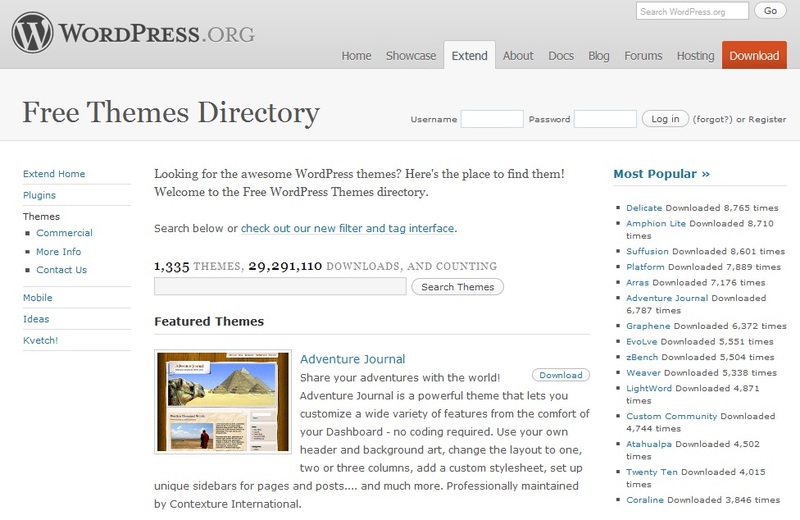 WordPress.org’s Free Themes Directory contains 1,335 themes that have been downloaded over 29 million times. Many other theme repositories exist online—just do a Google search. Since these open-source platforms have large and active online programming and design communities, it’s likely that many of the features you might want to customize your content (such as calendar applications, event listings, scripts to display your web analytics in to the backend, etc.) already exist as plugins and can be added into your template instead of designed from scratch. WordPress.org’s Plugin directory contains 13,670 entries (and yes, because I am a WordPress user I tend to use their material as examples). Going this route will save you time and money. Not only are custom-built sites and features expensive to create and maintain, they don’t necessarily position your content any better than a clean interface or existing plugin. The white text is simple and striking against the black background. The text is easy to read, and includes a link to the production company’s Facebook page. 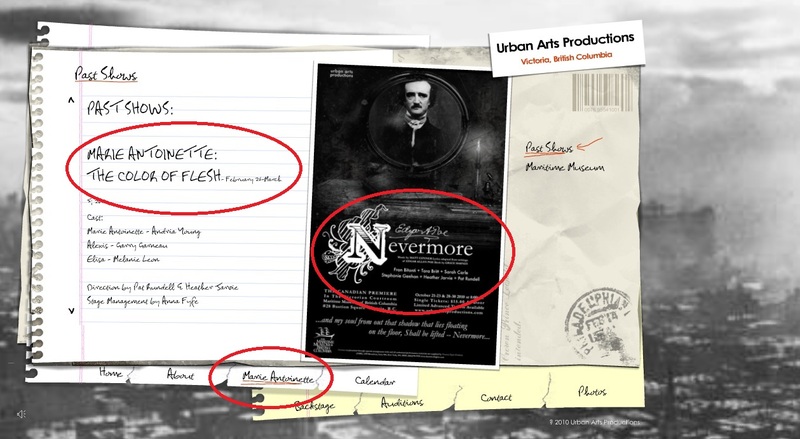 Note that while the navigation tab and textual description reference Marie Antoinette, the image is for Nevermore. Ideally, text and image should work together to orient the site user. Flash has its good points, but search-engine optimization isn’t one of them. Creating a Flash-based site creates barriers for the scripts that trawl the Internet for new content on behalf of search engines like Google, preventing them from accessing your content. After reading about the production, I couldn’t find the accompanying website when I ran a search using the venue and play name. 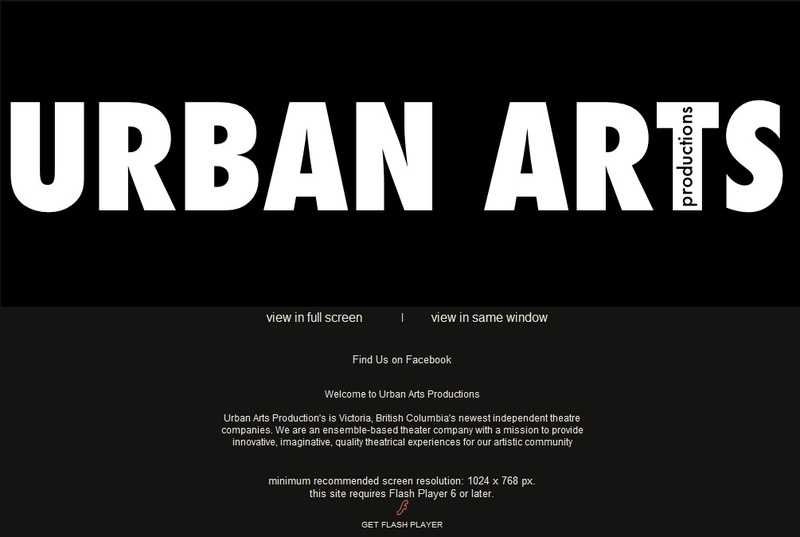 The right website didn’t turn up until I searched using “Urban Arts Productions” — which makes sense since that’s the only information available on the outside of the Flash barrier. Whether I opted to open Urban Arts’ site in a new window or my current tab, the Flash pages took over 10 seconds to load. The black-and-white skyline image in the background, combined with the flowery script on pseudo-lined paper (which also includes a barcode in the upper corner? ), evoke an older place and time, but clutter the page and make it hard to read. This problem is particularly noticeable in the site’s subsections, which feature more faux-paper backdrops and large, cursive fonts that forced me to scroll more than was necessary and were hard to read. Using so many graphic elements also slows the page-load time. Ditch the Flash for a simpler layout. Use a web-friendly sans serif font. Research existing web plugins to customize content without re-inventing the wheel (play around with the current Urban Arts site’s calendar feature and you’ll see what I mean). Structure content to help your website visitors more easily distinguish between past and current work, and make sure each show has a unique subheading and URL within your site’s navigation to assist with linking and references. Make actor and production member profiles easier to find (remember their names may be popular search terms for people looking for your content). Add a blog to document the company’s experiences and engage the audience. Tag each entry to improve the site’s searchability. Going with a simpler theme will mean that you can’t micromanage the design to the same degree, but will free you to focus on the work your site should do — communicating with your audience. Since Marie-Antoinette is a relatively new play (published in 2007) it’s plausible that potential audience members will want to know whether the script is good before they invest in a ticket. Theatre reviews in other cities (especially big theatre towns like New York City or London, England) that demonstrate the concept’s strength and script quality. Book-based reviews of the script on Amazon or other book sites. Marie Antoinette: The Color of Flesh was particularly well-reviewed in the New York Times; reading that review helped to convince me that it would be worthwhile to see. Since information like this is only a Google search away, do your audience a solid and provide it for them. If it’s relevant to do so, talk about what you’re doing in your production that’s different from the productions you reference this way. If nothing else, doing the legwork makes you look informed. If you had a website 10 years ago, all you had to worry about in terms of your content was getting material posted, organizing it coherently, adding a few photos and updating it at appropriate intervals. In the era of social marketing and Web 2.0 structures, your web presence includes any site where your content is featured. Some people will consistently come to your site to check you out; others may prefer only to interact with you through social media channels and never visit the website. Your web content has to allow and plan for both scenarios. It’s not enough just to think about your main page and subpages anymore — you also have to think about (and plan for) how information moves across your site to your social media pages and anywhere else your content appears. 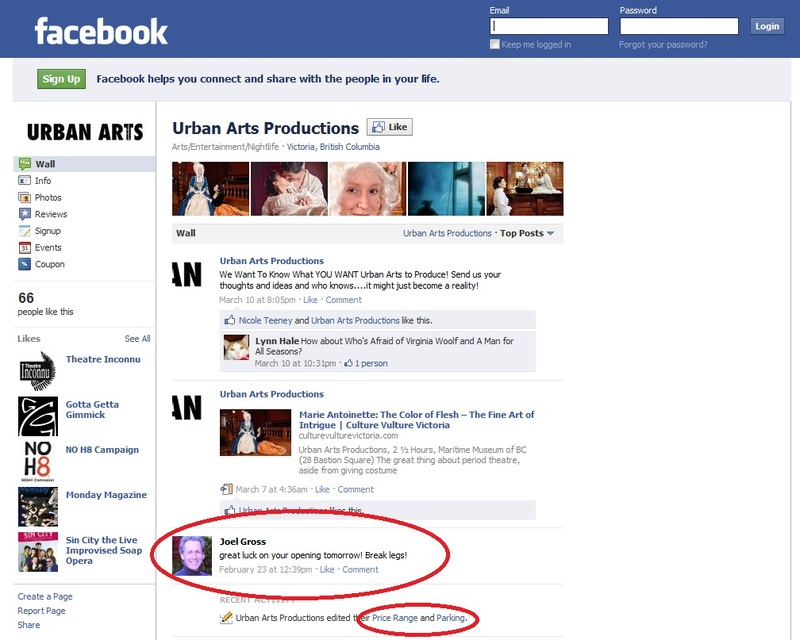 If the playwright has openly supported your production on Facebook, sharing that news with people through your website is a good idea. The updates are frequent and interesting, but the information they contain doesn’t simultaneously appear on their website in an appropriate place (such as changes to details about parking and ticket price ranges). So if I want current information on their activities and I don’t use Facebook, I’m out of luck. A blog would do a lot to solve this problem. Many social media sites like Facebook can be set up to instantly publish blog updates so that both the website and account page show key information. I’m not suggesting every single thing you post on Facebook should appear on your website or vice-versa, but having a plan to cross-purpose the big news integrates your work and saves you time. Add a Flickr account to make production and cast photos more shareable, particularly if the image quality is good. If you add video clips as discussed in Part I of this case study, consider creating Youtube or Vimeo channels. Storing your video files there and pulling them into your site as needed reduces your server demands while making your videos more shareable. If you go the Youtube route, you’re also putting your content into the world’s second-largest search engine. Create a LinkedIn account to build your production house’s profile and act as a hub for audition and production announcements, and other corporate news. (If some theatre-focused version of LinkedIn exists, please let me know.) Link the profile to your main site and share content in appropriate ways. Encourage everyone associated with your company to maintain a profile. Synch your blog and social media channels so that updates made to one place are pushed to as many other places as possible without additional manual work. There are applications that will assist you in automating this work. Next time, I’ll talk about working your production’s unique promotional angles.